If you are still doing holiday shopping and live near NYC, getting your gifts is as easy as walking over to the Molton Brown Pop Up at The Holiday Shops at Bryant Park, open through January 8th at Booth K07, 41 West 40th Street. 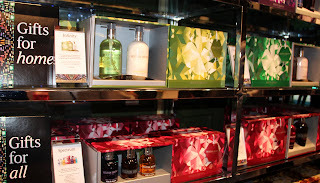 Molton Brown has some amazing shower gels, lotions, candles and more for bath, body, hair care and home. The gift sets make the perfect present. My gift pick is spectrum, $48, which comes with six 100ml bath & shower gels that are great for holiday travel - energizing seamoss, relaxing yuan zhi, travel-reviving cempaka, re-charge black pepper, warming eucalyptus and invigorating suma ginseng. Another favorite of mine is heavenly gingerlily collection. I find the Molton Brown scents to be sophisticated as well as unisex. What is your favorite scent to indulge in? If you can't pop over to Bryant Park then check out moltonbrown.com.